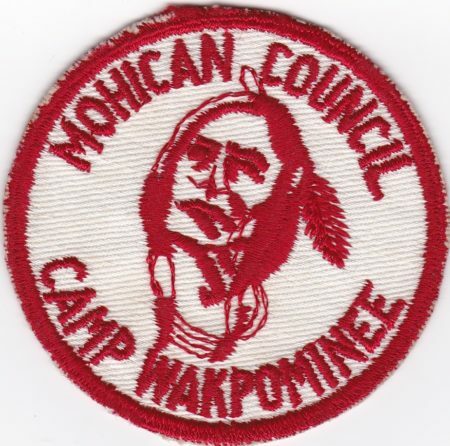 Another NYS Camp patch, this one is from Camp Wakpominee. The lodge which served this council also had the same name. Wakpominee was the camp of Mohican Council, it is still in use today as part Twin Rivers Council. Not sure of the year on this one it looks like a 1950’s or early 1960’s can anyone confirm the years it was used? This patch replaced the old red twill round and was used in 1956 and 1957. The achievement segments that I mentioned in the post on the large red felt were not used with this patch. The next two years, a new patch with different colors and the date on the patch were used. In 1960 four patches with a similar design but a different color were issued. Each color represented the years in camp for the camper. One of the colors was gold, another yellow. The colors were so close that they could only be differentiated by placing them side by side. One of the colors (I believe the gold) was then replaced by a green patch. Again this is one of these items from memory as no records were kept on which patch was used for which year or when the color of one patch was changed. I have mint examples of each patch and can provide pictures. I also have duplicates of some of them for trade.